The last decade has been one of uncertainty for laser angioplasty . 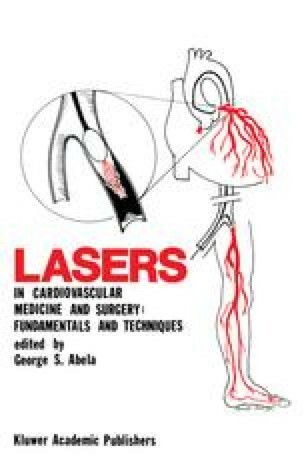 When serious research work started on the subject, only three lasers were generally available for clinical and experimental use , all of which were continuous wave (CW). Of these, light from the C02 laser would not go down a quartz fiber, which left the argon and Nd:YAG lasers as the basic research tools. It quickly became apparent that the light from both these lasers produced unacceptably high levels of surrounding tissue damage, which was demonstrably worse with the Nd:YAG laser . Alternative systems were sought. The work of Deckelbaum et al. in Boston  suggested that the use of a pulsed laser might substantially reduce surrounding tissue damage and increase safety margins, which led to investigations in a number of areas. Existing pulsed-laser technology was represented by the solid-state lasers, which form the mainstay of industrial and scientific uses: the ruby, Q-switched Nd:YAG, and Nd:glass lasers.